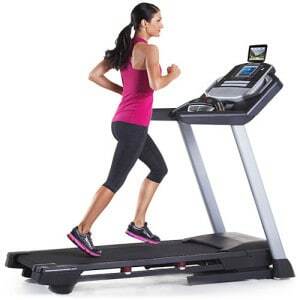 The ProForm Premier 900 Treadmill is ON SALE! A Touchscreen Machine for Only $999! The ProForm Premier 900 was upgraded in 2016 with cool features from a company that consistently delivers high-spec machines at a lower price. The Premier 900 is likely one of the cheapest models you will find with a full web-enabled full color touchscreen! To find this with some of the competition companies you would be spending at least $1500-$2000. In addition, the Premier 900 comes with a 3.0 CHP motor, iFit technology, a tablet holder, and folding technology. It’s a great value when priced at $999 and definitely worth a look. There is also a ProForm Premier 1300 with a longer deck, stronger motor, and larger screen if you’re interested. The ProForm Premier 900 is currently overpriced at $1,299 with free shipping. Financing is available. Instead, check out the ProForm Power 995i. 3.0 CHP Motor – This is a nice sized motor for the price. It will be able to handle a variety of workouts including intervals, speed, and endurance training. There are some other models from Icon Fitness (including ProForm and NordicTrack) with larger motors, but this size is great for a budget machine. 7″ Full Color Touchscreen – Like we said before, this is a BIG DEAL. You won’t often find machines in this price range with a full color web-enabled touchscreen. You can swipe your finger to switch between your workout stats. This screen uses the Android browser. iFit Coach Ready – Use workouts created by certified personal trainers. Run exotic routes around the globe. Sync your machine with Google Maps to simulate real life hills and valleys. This is all possible with iFit Live. Pretty cool, right? The only downside is that this system does require an additional monthly subscription sold separately. Adjustable Tablet Holder – Do you like to watch Netflix while you work out? This tablet holder gives you a safe and secure place to store your device. 20×55″ treadbelt – This length belt will work fine for a lot of users, but if you are pushing 6’0″ or taller, you should look at the Premier 1300 with its 60″ belt instead. 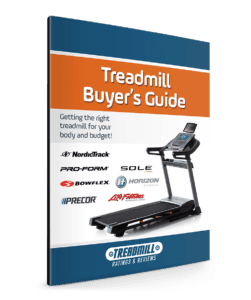 ProShox Cushioning – Treadmills are famous for being uncomfortable to run on, but ProForm has added cushioning along the entire deck to protect your joints and provide a more comfortable workout. You may enjoy this even more than outdoor running! Folding Technology – The ProForm Premier 900 folds for easy storage. This is handy if you are tight on space or live in an apartment. 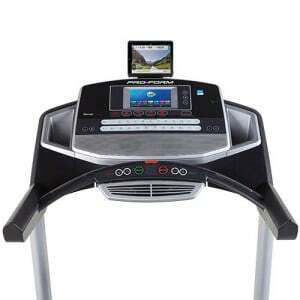 iPod compatible – Plug your iPod directly into the machine and listen to your tunes while you work out! Quick Speed and Incline Controls – The Premier 900 goes from 0-12% incline and 0-12MPH. 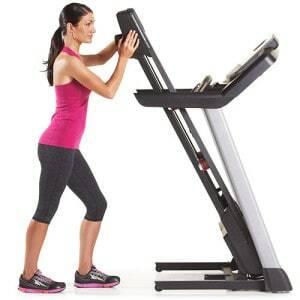 We REALLY like that you can change up the speed and incline with easy buttons. We hate having to type in lots of numbers and hit enter in the middle of my run. This is much easier. 30 Workout Apps– Workout apps help break up the boredom of running in place. This is a nice selection of programs developed by certified trainers. ProForm Premier 1300 – Read our full review here. We’ll say it once more. We can’t believe you can get a full touch screen web enabled machine for under $1000! This pricing may not last, but while it does, it’s a fantastic deal. Besides that, the ProForm Premier 900 has a nice selection of features including the iFit compatibility, 30 workout apps, folding, and a tablet holder. The user weight limit is 325 lbs and manufacturers often overstate this value, so you might need to look for a more heavy duty machine if you exceed this limit. ProForm is part of Icon Fitness so they are able to offer more specs for a lower price. You might consider looking at the Premier 1300 if you are taller or looking for a larger screen and motor. The pricing is not quite as good on that machine though.